Why should I chose plantation shutters ? Plantation shutters are a simple and stylish addition to any home. Plantation shutters compliment both traditional and contemporary styles and enhances your interior decor as well as looking great from outside. Shutters come in a variety of wood types or durable vinyl; it’s easy to enjoy the timeless style and flair of these beautiful, classic window coverings. Mounted indoors, plantation shutters control light and enhance privacy through effortless operation. Features like a hidden tilt rod allow you to personalize your plantation shutters to meet the unique needs of your home too. 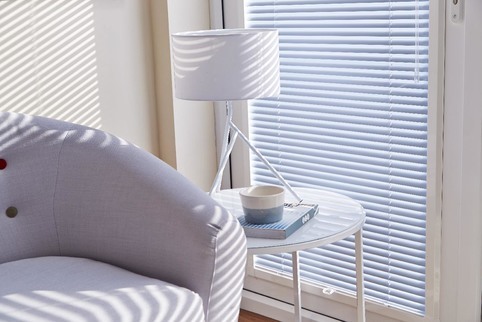 Book a free in-home consultation with your Shutterblind expert to learn more about our full range of plantation shutters. + Will Shutters makes my windows look good? If aesthetic beauty and lasting impressions are of the upmost importance to you, the Shutterblinds collection of wood shutters offers the ideal solution. These elegant window coverings are made of the highest grade timber and MDF products, harvested from certified forests to help conserve the environment. Our wood shutters are available in a variety of paint and stain finishes that preserve the natural allure of the wood grain. You can also choose from 47mm, 63mm, 76mm, 89mm and 114mm louver sizes depending on your viewing preferences. 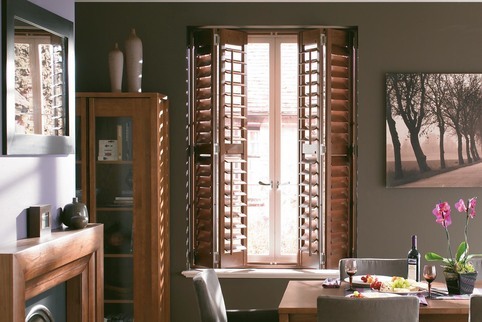 The Shutterblinds collection of wood shutters not only provides a heightened level of sophistication and enduring style, they also provide an excellent solution for light and privacy control. Shut louvers tight in the evening to prevent outside view; open them wide in the morning to let the sun in and open up your room. + Are shutters suitable for bathrooms and high moisture areas ? Our collection of moisture resistant window coverings is made from the finest materials and adheres to stringent manufacturing processes so that they may withstand the test of time. No matter how humid the environmental conditions may be, moisture resistant window coverings will retain their integrity and beauty. Choose from our range of composite shutters that can resist high moisture areas like bathrooms while bestowing timeless elegance, or from our line of faux wood blinds that are well suited for places with high humidity like coastal homes. Talk to your local Shutterblind expert to find the best moisture resistant window covering solution for your specific needs. + Are they suitable for Arched and Unusual Shaped Windows ? When it comes to furnishing your windows, arched windows can often pose a problem because of their unique shape and commonly out of reach location. Good thing Shutterblinds offer premier shutter products that can cover most any specialty shape or size. Shutter Blinds’ specialty wood shutter line comes in fixed and adjustable settings. You can choose from various designs such as sunburst, slat-burst and blackout arches. Each is custom made to fit your specific window(s) and comes in a variety of paints and stains to match your existing home décor. If you decide to go with adjustable specialty shutters, we recommend you add motorization since specialty windows are often hard to reach. + Will shutters be Energy Saving? Without energy-saving window coverings, as much as 50% of a home's heating and cooling energy can be lost through its windows. No need to panic however! All Shutterblinds energy-saving window treatments provide effective insulation, offering your home increased protection against heat loss during the winter and heat gain during the summer. Among our more effective energy-saving window treatments are honeycomb shades, hardwood shutters and window film. These products will help create a comfortable environment for your family and guests while reducing your heating and cooling costs for long-term energy savings. + Are shutterblinds doing all they can to be Eco-Friendly? Shutterblinds believes in finding the perfect marriage between style and sustainability when it comes to our window coverings. Because of this, we take active steps to help ensure our products promote a healthy environment. All our wood products are carefully harvested through sustainable yield forest management. This means that the amount of wood harvested is below the levels of tree growth. We also use recyclable packaging when shipping our products and most of our non-wood product components can be recycled as well. These are just some examples of how Shutterblinds takes window coverings a step further by helping reduce your carbon footprint! 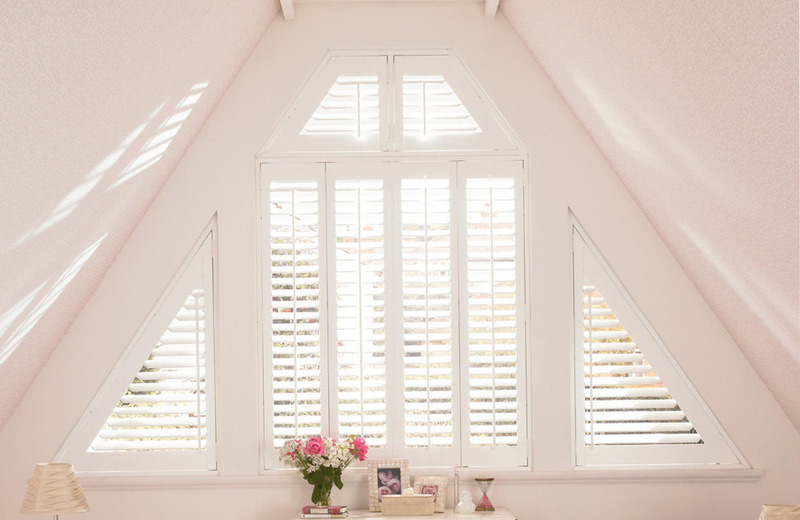 + Can shutters be fitted to Bay Windows? Bay windows can add depth and appeal to your home. When furnished correctly, they can make it shine. A great option is dressing them in hardwood shutters with 3.5 inch louvers and a hidden tilt system. This will create an aura of sophistication while maintaining your wonderful view. A beautiful set of shutter panels can also increase the allure of your bay windows. Sheer voile curtains are a good choice since they’ll give you just the right amount of privacy and, at the same time, lightly filter sunlight to create an overall warm ambience. Remember, you can easily add motorization to any bay window covering. This is especially useful for hard to reach bay windows with a built-in seating area. Our collection of moisture resistant window coverings is made from the finest materials and adheres to stringent manufacturing processes so that they may withstand the test of time. No matter how humid the environmental conditions may be in your area, Shutterblinds moisture resistant window shutters will retain their integrity and beauty. Choose from our range of composite shutters that can resist high moisture areas like bathrooms while bestowing timeless elegance and are well suited for places with high humidity like coastal homes. Talk to our Shutterblinds expert to find the best moisture resistant window covering solution for your specific needs. + What about Security & Privacy? We know how important it is to have a safe and secure home environment. After all, your home is your retreat and an intimate setting for spending time with loved ones. With window coverings from Shutterblinds, you can rest easy knowing your windows are properly and professionally furnished to meet your specific security and privacy expectations. Whether you choose to furnish your windows with shutters, blinds, or curtains,or any combination thereof, our privacy features will be there to shield your family activities and belongings from outside view. + Can you make shutters or blinds fit large windows? Have you been staring at that oversized window in your living room or bedroom wondering how on Earth you’re going to furnish it? Well wonder no more; Shutter Blinds has a multitude of options for you to choose from. 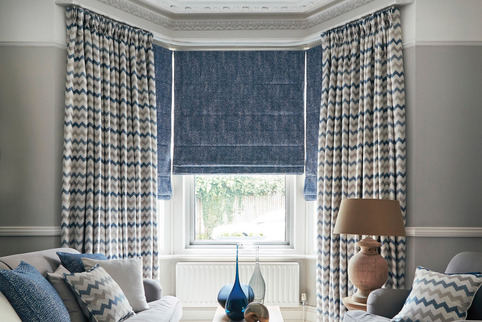 Panel blinds, 2 on 1 headrail blinds, or even practical vertical blinds are all great solutions. Of course you may want to fully preserve your wonderful view. In this case, consider our range of custom made shutters that contains the added bonus of helping deflect harmful UV rays. + How Child Friendly are they? As toddlers grow, so does their curiosity of the world around them. Basic household items – including window coverings – can turn into potential hazards if overlooked. Making our window coverings safer for homes with infants, young children, and pets is one of Shutterblinds top priorities. In light of this, we have developed a wide range of child-safe window coverings that can reduce the risk of accidents. ShutterBlinds offers cordless blinds, motorized shades, retractable lift cord, cord cleat and wand control systems to not only help create a more care-free environment for your kids and pets, but make window covering operation a breeze. + What shutters and blinds are suitable for commercial use ? Opening up a business or already own one? If you thought Shutterblinds was limited to providing quality window treatments to homeowners alone, think again. From restaurants to retail shops, hotels to schools, we can provide window treatments to any type of business or institution and have been supplying blinds and shutters for 25 Years. A key advantage is that we at Shutterblinds are uniquely attuned to specific industry needs. Whether you require child-safe, environmentally friendly, energy efficient or fire retardant window coverings, the perfect solution is readily available. If you own a business or know someone who does and may be in need of window coverings, please call for more information. At Shutter blinds we believe in finding the perfect balance between style and sustainability when it comes to our shutters. Because of this, we take active steps to help ensure our products promote a healthy environment. All our wood products are produced using woods that are carefully harvested through sustainable yield forest management. This means that the amount of wood harvested is below the levels of tree growth. We also use substantial recyclable packaging when packing our products and most of our non-wood product components can be recycled as well. These are just some examples of how Shutterblinds take window shutters a step further by helping reduce our carbon footprint! + How do I clean my shutters? Regular dusting is recommended using a feather duster or the small brush attachment on your vacuum cleaner. Hand prints and other marks can be removed either using a damp cloth or clean using a product like Pledge. + Can blinds be motorized? Talk about convenience! Motorized window coverings powered by Somfy® let you control lighting and privacy preferences at the touch of a button. They save time by simultaneously opening or closing window coverings throughout your home, even on those hard to reach windows. Window coverings motorization reduces the wear and tear that comes from manual operation. Since they’re inherently cordless, motorized window treatments also eliminate the danger of your children or pets becoming entangled in them. Choose from a wide array of control options such as wireless wall switches, hand-held remotes and timers. Whether you prefer rollers or romans, Pleated or wood all popular ShutterBlinds window coverings can be motorized. Bring us to your place of business. Windows of any shape are our specialty.